So, as you might now, I'm not a huge fan of book reviews. However, I do post them occasionally and today is one of those occasions. Yeah! I’m always a little bit wary when it comes to Christian Fiction, and even more so when it comes to Christian YA. After all, what better place to lead people to the Lord than in their teens. I’m pleased to say that books such as It’s Complicated are slowly changing my opinion of Christian YA fiction, and I couldn’t be happier. This book follows four college freshmen as they try to navigate the stress, responsibility, and drama of college. It more specifically deals with the challenges Christian teen girls encounter when dealing with boys. Each roommate, Hannah, Kat, Palmer, and Claire, faces a different problem—or sometimes more than one—with the boys in their lives. Hannah just wants to get a nice boyfriend to start off her freshmen year right, but it seems all the hot boys on the college campus are spoken for. Well, all except the two which are chasing Kat. She hardly has time for school and soccer practice, and certainly isn’t looking to add a boyfriend to the mix even if she knew which boy she’d choose. Palmer on the other hand, is perfectly content with her high school boyfriend, although being at separate colleges is putting some strain on her relationship. Until her boyfriend starts putting on the pressure for her to go farther than she’s really looking to go. Petit little Claire just wants to survive her year without being noticed or losing her scholarship. After a brief summer “flirtationship” turned into something much darker, the last thing she’s looking for is a boyfriend. The interactions of these four girls with each other and a slew of hot college boys will have you turning pages, laughing, and crying. 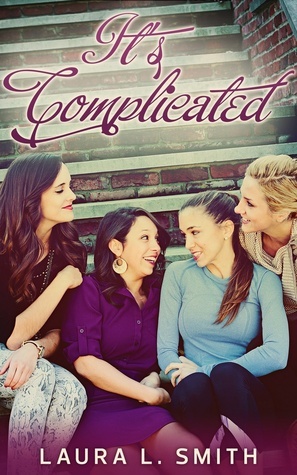 The way these four girls find their strength in God without the book turning “preachy” is truly a breath of fresh air. Laura Smith did a wonderful job with voice of this book. The tone sounds just like older teenage girls, which I think some YA authors struggle with. The point of view shifts were sometimes confusing, but other than that, I really, seriously loved this book and can’t wait for the next one in the Status Update series. Sarah, thank you for the amazing review! I appreciate the caution to younger girls, because yes, this one's for upperclass high schoolers and college girls. I'm so blessed to have gotten to know you through the street team! I really enjoyed this book too. It is a powerful story that can pull at the heartstrings. Wonderful review, Sarah! You captured it! Thanks for your support of Playlist Fiction!